Cal, Elkhorn, Wisconsin. From The Bikeriders. Danny Lyon’s blog is called Bleak Beauty. It’s a fitting description for that which he has always sought out with his eye. Whether in the SNCC photos of nonviolent protest in the South, or his photographs of death-row inmates in Texas; whether exploring the dying Chinese culture in Shanxi or the oblivion of Lower Manhattan–Mr. Lyon has always suffused his photography with a sense of life as simultaneously romantic and doom-laden. Nowhere were these qualities so obvious as in his 1968 book, The Bikeriders. Bikers have always viewed themselves as the ultimate in American Romanticism: attached to the road, to the open, to the fast, to the dangerous. Throughout biker culture, too, is the omnipresent threat of death, to which the response is a glory that overcomes even that threat. Small wonder then that Mr. Lyon was drawn to that subculture. His temperament was suited to it possibly better than any other photographer of his time and his commitment to living within it definitely so. 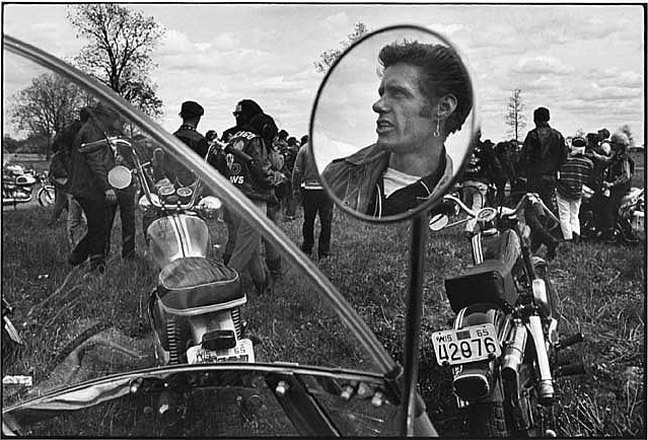 For four years from 1962 to 1966 he lived among the biker gang, the Chicago Outlaws, and responded to their life with his pictures. 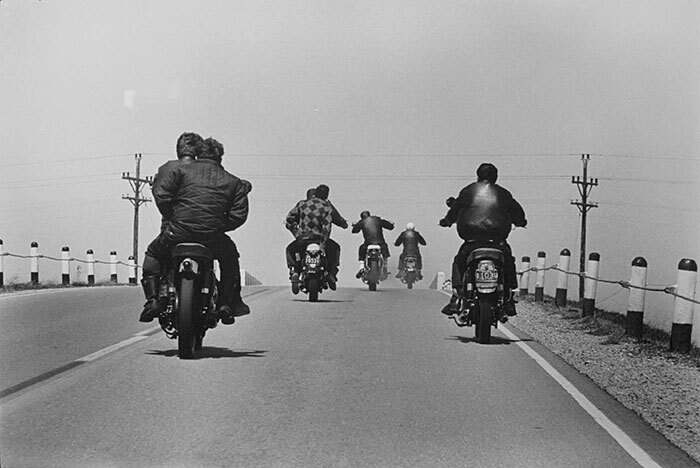 At the time of the book’s publication in 1968 there was no such thing as Easy Rider. Nevertheless, The Bikeriders winds up inevitably being discussed along with Dennis Hopper’s film, which merely shows how clueless most people are about the book. More than anything, Easy Rider is a film based on treating biker life as spectacle. The Bikeriders could hardly be more different. Not one of the fifty-plus photographs in the book could be considered spectacular by any measure. While Mr. Lyon referred to his book as “an attempt to record and glorify the life of the American bikerider,” one would be hard-pressed to claim he achieved anything glorious in his images, and even less the rather empty glamour of Easy Rider. It is a rare treat, then, to see photographs from the book displayed at the Henry Art Gallery, in a larger format that the book allows. The prints are well-done, and every bit as striking in person as one would expect. There seems to be no logical order to the prints on the wall. They are not exactly done by book page, nor are they particularly thematic in their grouping. The tiny gallery into which the prints have been forced is more of a straitjacket than a sequence. Worse still, a third of the pictures rest on the walls at a height roughly the height of my knee, forcing anyone taller than a fifth grader to lean or kneel simply to look at them. Another third of the pictures are somewhat higher than my eye level, and I am quite tall. I can only imagine that anyone of average male or female height must strain to reach them. Fifty-four pictures are thus shoehorned into a space completely inadequate to the task. I imagine this is what it means to be on the rack. Between the cluttered frames on the wall one’s eye has nowhere to rest at all. Instead, one constantly faces a wall of solid black and white images, over half of them requiring elegant contortions of one’s neck and spine merely to see. One of the big excitements about the 2003 Chronicle Books edition of Mr. Lyon’s book, which is placed on a table immediately to the right of the gallery entrance, is that it included fifteen unpublished photographs, and fourteen images that were originally shot in color were restored to color print. So why were the photographs known to be color prints printed black and white for this exhibit? One can argue that the decision was to serve as an advertisement for the new edition. The upcoming Aperture edition of the book restores the original printing of the book and reproduces no images in color. Aperture’s decision, to me, is a mistake. It is also a lost opportunity. It is well-known that the original publisher of The Bikeriders printed the book in black and white as a cost measure. Aperture ignored this aesthetic (and possibly moral) reality. At least two of the images in the book are far more striking in their original color versions than in monochrome. The Clubhouse during the Columbus run, Dayton, Ohio photo comes immediately to mind. In seeking to recreate the original edition of the book for what I can only surmise are sentimental reasons, Aperture have lost the opportunity to print the book the way Mr. Lyon wanted to book printed in the first place. They have also given up on making a unique book. Such a book would not be an “expanded edition,” as the Chronicle version is, nor would it be yet a tedious “facsimile edition” of the original book. Instead it would honor the author’s original intent and it would be the only version on the market ever to do so. As the upcoming book fails, so fails the Henry’s exhibit. Only it fails worse by not even providing viewers enough breathing space in the gallery to think about the work. 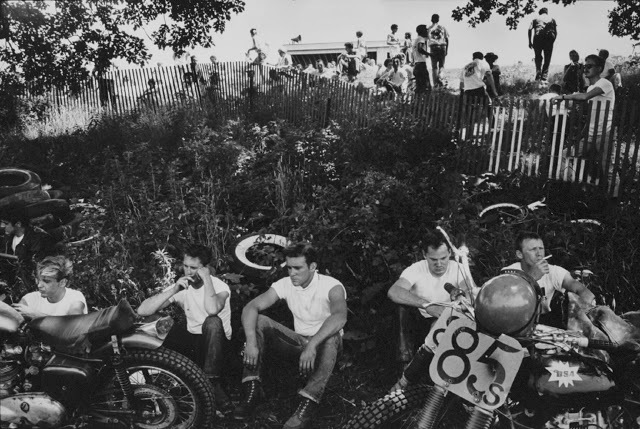 It is not so much an exhibit as an assault, and while it may be lovely marketing Newspeak to wish to “assault the senses,” Mr. Lyon’s book deserves a space more in keeping with the open road that is at the core of the photographs, and the heart of the biker ethos.